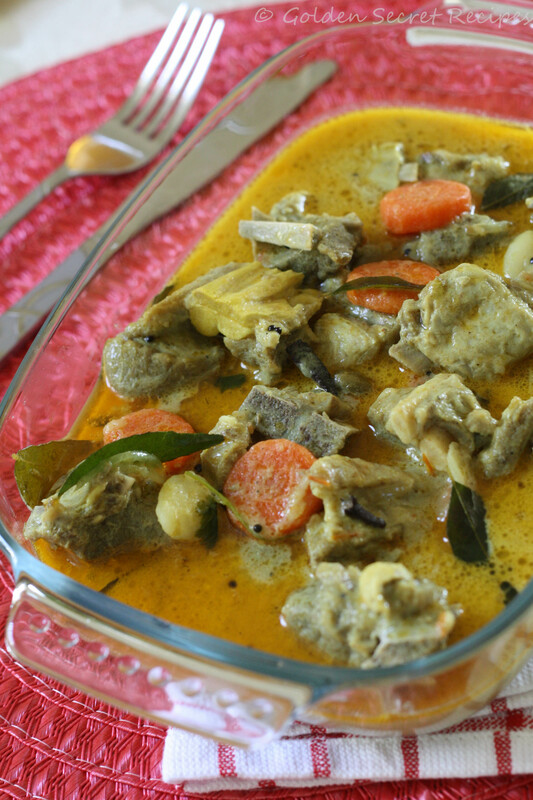 Mutton Stew: Mutton or Goat meat is not something we buy a lot. Frankly speaking, I don’t even like any red meat. Even DD isn’t a great fan whatsoever or that’s how I would like to pretend/believe 😉 However, I had this stew at a friend’s place and I liked the flavor and combination with appam. From that day, I wanted to make it one day. Its been months since I have been thinking of making it, but finally I went and bought mutton few days back. And of course, this was the only recipe I had in mind 😛 Thanks to my dear friend Moneesha for the tips and guidance. She took time to elaborate the process and I followed it to the dot, so that I don’t go wrong. Also because I don’t make mutton often. This probably was just my 2nd time buying mutton!! Well, the stew came out very well and is a killer combination with appam. Well, after making the stew I realized that in our house we make almost the same thing using egg. But we never called it stew and also never made the same with any kind of meat. So I couldn’t relate. Dumb!!! 😀 Am gonna soon try the same with chicken. Am sure that would be good also. TIP: Again, I am borrowing this tip from Moneesha. If you don’t get your mutton soft, then try giving more whistles that you otherwise do. After the 1st whistle, keep it for 15 mins (apprx. 30 whistles) and the mutton will be soft. Somehow, I feel the mutton is kind of hard here and takes time to get soft. You could also try to use some meat tenderizer. 1. Clean the mutton/goat meat. Season the mutton with 1/4 tsp salt and black pepper powder. Cook the mutton using less water, in a cooker. Mutton will leave out some water by itself, so less water is sufficient to cook the mutton in a cooker. To make the mutton soft, you might have to give many whistles. I gave about 30 whistles. 2. Heat oil in a saucepan and put cloves, cinnamon and cardamon. Once it splutters/pops, add crushed ginger and garlic, slit green chilli and 1 strand curry leaves. 3. Once the ginger and garlic turn light brown, add sliced onion. Saute occasionally till onion turns light pink. 4. Then add chopped tomato. Cook till tomatoes cook through. 5. 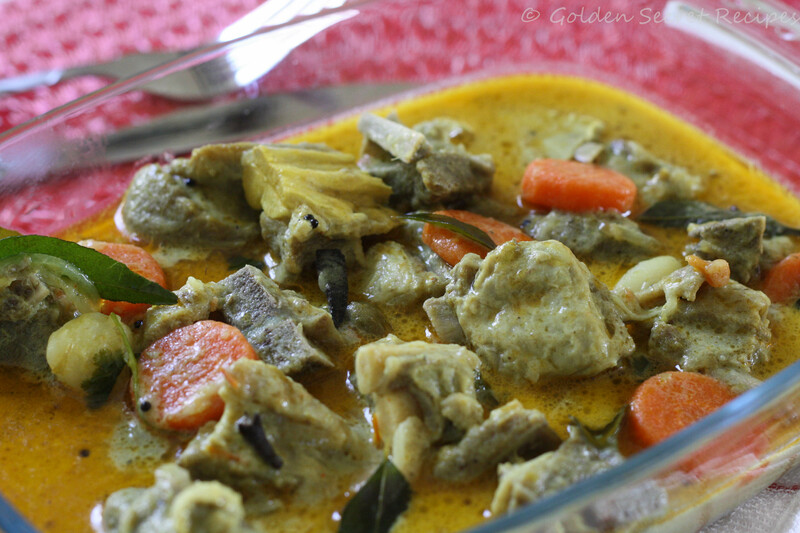 Then boiled mutton(including the stock), vegetables(potato and carrot), remaining salt and thin coconut milk. Add little water occasionally if required. Let this cook in medium flame till the vegetables cook well. 6. Once the vegetables cook, add thick coconut milk and water to bring it to the consistency you prefer. Bring it to boil in medium high flame and remove from heat. Garnish with chopped coriander leaves. 7. Heat ghee in a pan. Put mustard seeds. Once it splutters, add sliced shallots and remaining curry leaves. Once the shallots turn light brown, remove this from stove and pout it into mutton stew. Serve with Appam, Idiyappam or Chappati! This entry was posted in Gravy 'N' Semi Gravy varieties, Specialities-Mutton/Goat and tagged Goat curry with coconut milk, Kerala mutton curry, Kerala Mutton Stew, Mutton curry with coconut milk, Mutton Stew, Mutton with coconut milk, Side dish for appam. Bookmark the permalink.